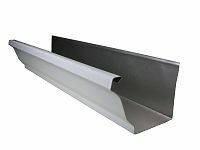 We carry the popular K Style Gutter as well as Traditional Single Bead Gutter and Reverse Bead Half Round Gutter. Aluminum gutters are a great product. They don’t rust, are available in popular colors, and can be shaped quite easily. Aluminum rain gutters have been around for 30+ years. Aluminum gutters also have the advantages of being lightweight and relatively easy to work with. They are weather-resistant across the board and maintain their integrity in cold climates.